Our showroom has your favorite brands and we'll help you find the right solution for you needs. Take the next step with your logo embroidered or as a patch on your uniforms. We design and create quality patches for clubs, police, military, civic groups and more. All our embroidery is done on-site with the highest quality of threads. Southern Star Embroidery is the one-stop-shop for all your embroidery, screen printing, logo design and custom patch needs. Dating back to 1989, we’re the oldest embroidery company in Hampton Roads, making our level of experience greater than any other. After one visit to Southern Star Embroidery, you’ll understand how we’ve maintained 23-year long relationships with some of our very first clients. Southern Star is a woman-owned company, and all our expert embroidery is done in our onsite manufacturing facility in Virginia Beach. We take great pride in our work and the products we produce. We use the best threads available and guarantee all embroidery is well-sewn, hand-finished, inspected, and easy to wash. Our superior-quality workmanship and fast turnaround rate are unmatched. Our showroom boasts the largest selection of apparel and uniforms in the region from over 100 manufacturers. We invite you to look around the site or stop by the showroom to view the many apparel and design options we offer. Now is a great time for embroidered sweats, fleece pullovers, jackets, winter hats and hoodies! Contact us today and we’ll help you find the right selection for your needs. 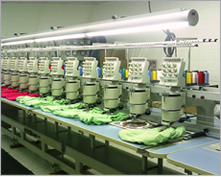 "I have been using Southern Star Embroidery for our golf shirt and cap needs for 9 years. We typically place 3 to 4 orders per year and always receive our items with the highest quality logo appearance, delivered on-time, and would recommend Missy and her team to anyone looking for quality workmanship and dependable customer service." Southern Star Embroidery is a certified Small, Women and Minority (SWaM) owned business. Certification Number: 701176, type WS. The best embroidery in Hampton Roads. For superior-quality and fast turnaround, come to Southern Star. Southern Star is your one-stop shop for promotional items and corporate gifts, with something for every budget. Stop by to see our huge selection. Southern Star uses high-quality thread and superior workmanship to create the best custom embroidered patches in Hampton Roads. Learn more about what makes Southern Star best.